Dr. Thomas E. Roberts graduated from the Chicago Homeopathic Medical College in 1888 and taught there from 1890 until 1902, while he also served as an attending physician at Cook County Hospital. He was a general practitioner in Oak Park and Chicago until his death; he helped establish West Suburban Hospital and served on its staff and as a director. In addition to his excellent reputation as a family physician. Dr. Roberts had a remarkable range of other interests. He served as captain and assistant surgeon of the First Illinois Infantry during the Spanish-American War of 1898. This experience sparked an active speaking career and a lifelong interest in veterans' groups and patriotic organizations, including the Illinois Society of the Sons of the American Revolution. He was a charter member of the Oak Park YMCA; a director of the Oak Park Trust and Savings Bank for thirty years; founder and chairman of the local Red Cross for twenty years; a charter member of both the Oak Park Club and the Oak Park Country Club, and an organizer of the Oak Park Civic League, dedicated to good government. 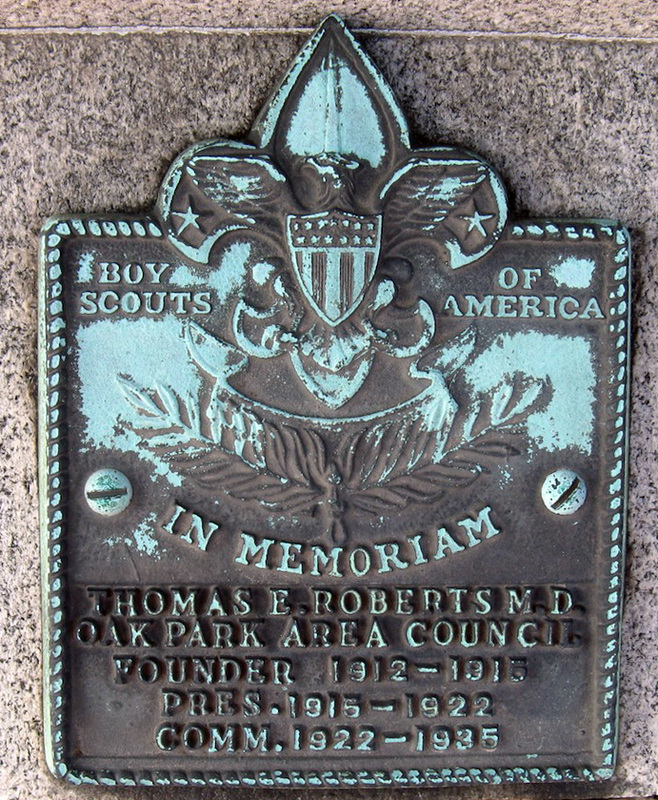 He took a special interest in the Boy Scout movement and was a founder of the Oak Park area Boy Scout council. He also found time for mountain climbing, golf, cycling, and Republican Party politics. His brother, E. E. Roberts, was a prolific Oak Park architect. The name "Hurlbut" also appears on the monument. Dr. Roberts married Alice Hovey Hurlbut in 1892; her adoptive parents, Samuel and Mary Hurlbut, owned a palatial home at the northwest corner of what is now North Boulevard and Forest Avenue in Oak Park. That building became the first permanent clubhouse of the Oak Park Club, a prominent social organization, in 1893.